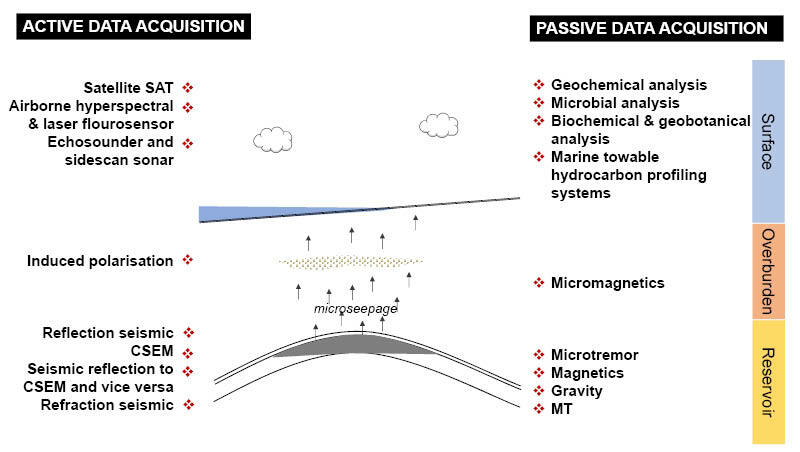 Figure 1: Technology overview of data acquisition across the reservoir, in the overburden or at the surface (ground, seabed, water column, or air). A number of hydrocarbon exploration processes have been developed to ensure consistency and avoid personal biases when attempting to correctly rank prospects and make appropriate drill or drop decisions. One such process is the calculation of Geological Chance of Success (GCOS), which is a systematic approach to managing prospect risking by multiplying fractions representing the likelihood of each of the parameters: structure, reservoir, retention, and charge. Each GCOS parameter is well described, and the explorationist’s input and assessment is based on past drilling experience, analogue field studies, well cores and outcrops. 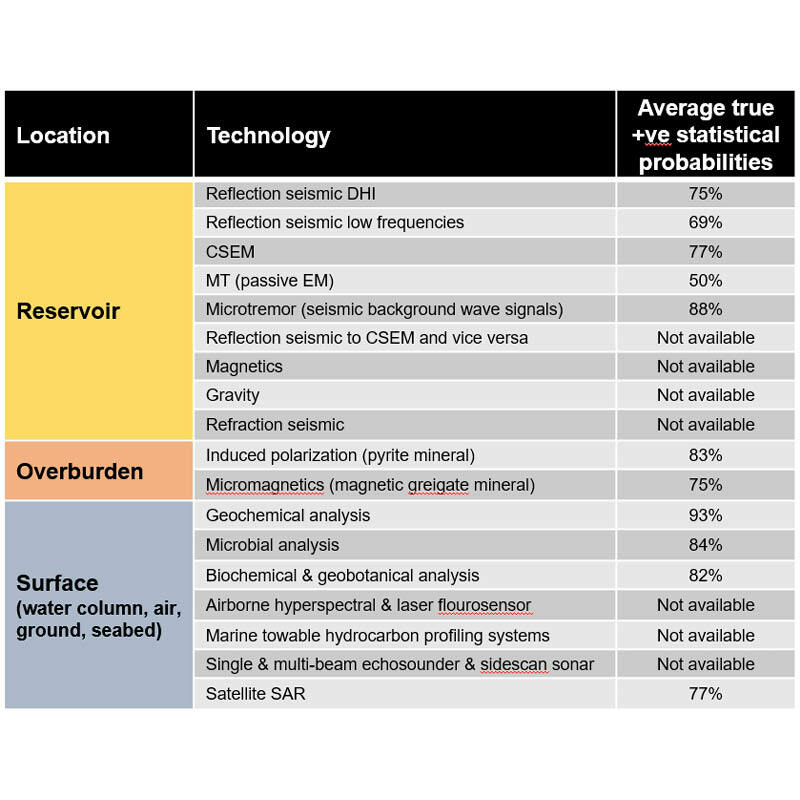 In addition, acquired data from different technologies can be used to describe an undrilled prospect in order to assess reservoir properties and hydrocarbon presence. This is in general a reliable process. Westwood Energy Group has shown that for 1,163 wells from 2012 to 2017, the pre-drill technical success rate (assumed to correspond to GCOS) is, as expected, 22 percentage points higher than the commercial success rate, with the actual proven hydrocarbon volumes only marginally larger than the predicted volumes (Kunjan, 2018). Richmond Energy Partners have shown that the pre-drill prognosed commercial chance of success versus the actual commercial success rates of a couple of hundred wells drilled worldwide by 40 oil companies between 2009 and 2013 were within the limits of expectations (Kunjan, 2016). However, no overview exists of the technologies available when gathering information to assign fractions to each of the four GCOS parameters. This article provides such an overview, offering a track record for the majority of the technologies as statistical probabilities and with a description of the constraints and limitations in utilising the available data and technologies. The technologies shown in Figure 1 can all provide data input to the GCOS calculation, but there are significant differences between them in acquisition approach, validity of the data and their possible impact on the determination of each of the four GCOS parameters. Table 1: Technology overview with a description of the methods and statistical probabilities. Data can be acquired passively by measuring signals emitted by the earth or actively by emitting signals and recording the earth’s corresponding responses (Figure 1). It can relate directly to the reservoir and hydrocarbons through an in-situ measurement from the surface, resulting in very valuable information, but this requires various degrees of processing and interpretation to convert the results to an actual prediction of reservoir properties and presence of hydrocarbons. The other technologies measure the result of microseepage, and in some cases macroseepage, of hydrocarbons from the reservoir to the surface. Through measuring either the mineral alterations due to hydrocarbons in the reservoir overburden or traces of hydrocarbons at the surface or various surface changes due to the presence of hydrocarbons, the result of the microseepage can be mapped (Table 1). It is well documented that mature source rocks and most oil and gas accumulations leak hydrocarbons, that this microseepage is widespread in all hydrocarbon basins, predominantly vertical, and that it is dynamic. As the seepage expression can be some distance from the hydrocarbon reservoir, the resulting data needs to be carefully managed when used in the GCOS calculation. Table 2: Review of the data measurement type for each technology. As not necessarily all hydrocarbon reservoirs exhibit microseepage (although most do), there will be instances where a lack of overburden or surface expression of hydrocarbons is not necessarily proof that there is no deeper hydrocarbon accumulation. Hence, a false negative hydrocarbon prediction is a possible risk. Two technologies provide quantifiable data, including reservoir properties, saturation, gross volume etc. 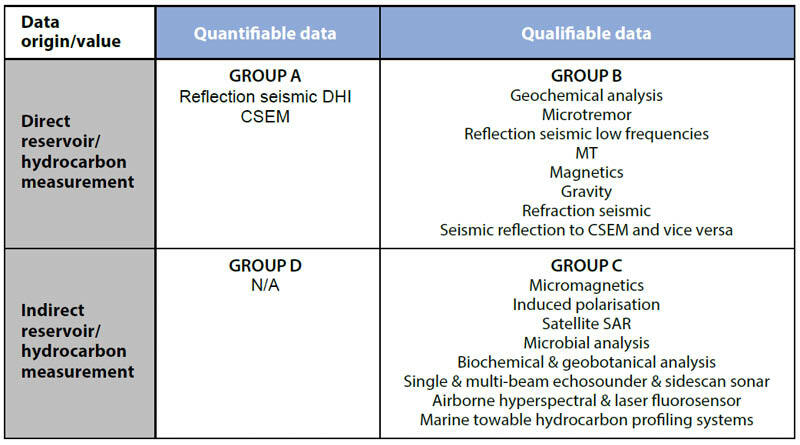 (Table 2: Group A), whereas the remaining technologies mainly provide qualifiable information about the reservoir properties and presence of hydrocarbons (Table 2: Group B and C). Publicly available statistics based on utilising technologies for prediction of reservoir properties and hydrocarbon presence are limited, considering the annual investment in drilling wells to explore for hydrocarbons. However, for two-thirds of the technologies some true positive statistical probabilities from historical track records are available (Maver, 2019). 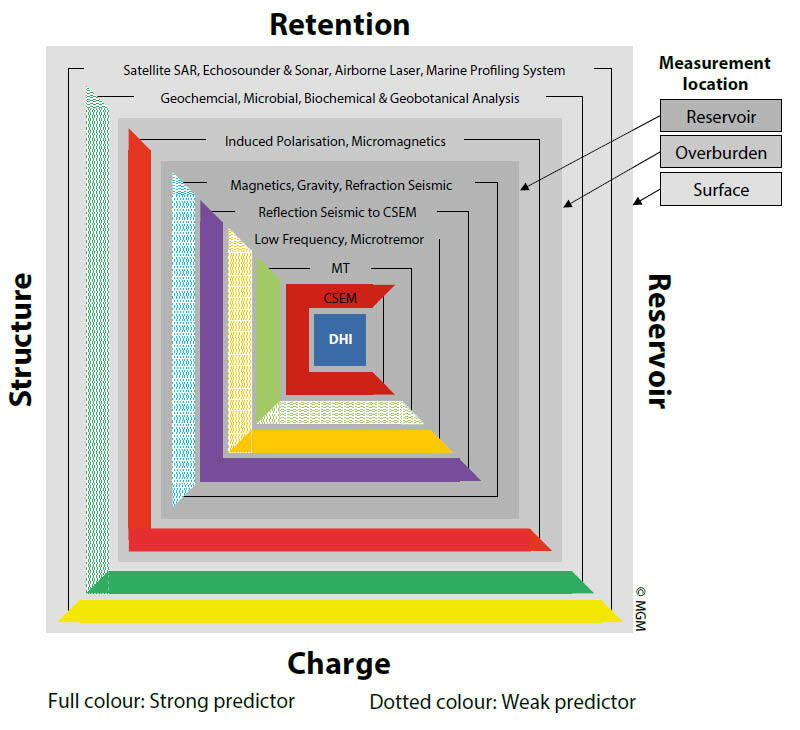 Figure 2: Technologies (full names in Table 1) that can provide input to the assessment of structure, reservoir, retention and charge. Full colour indicates a significant data impact, whereas a hatched colour indicates a weaker and more general data input. This is based on a subjective subdivision. © MGM. The acquired data can be used as support to assign fractions to the four GCOS parameters, remembering that GCOS = Structure x Reservoir x Retention x Charge. Direct reservoir measurements using active acquisition provide quantifiable information about the structure size, reservoir properties, presence of and hydrocarbon volume in place (Table 2: Group A). This is the reason for Direct Hydrocarbon Indicators (DHIs) seen on reflection seismic data being the technology of choice by oil companies. It also explains the current interest in Controlled Source ElectroMagnetic (CSEM) data, as that is the only other technology providing quantifiable data. CSEM is also better at predicting retention of hydrocarbons than reflection seismic DHIs (Hesthammer et al., 2010). CSEM data is also an important technology, along with Magnetic Telluric (MT) data, in cases where reflection seismic struggles or fails to image, for example in sub-salt and sub-basalt regions. Through a direct reservoir or hydrocarbon measurement, technologies in Group B (Table 2) can provide qualifiable information about hydrocarbon charge, and potentially some information in relation to structure, but only as approximate geographical outlines. Geochemical analysis relating directly to reservoir hydrocarbons is a very powerful indicator of a working hydrocarbon system, even though it is measured at a distance from the reservoir. The technologies in the final group (C) in Table 2 do not provide data directly but instead provide indirect information qualifying the presence of charge, and in some cases the approximate geographical outline of structure. For example, micromagnetics and induced polarisation are technologies related to vertical hydrocarbon seepage from the reservoir forming either greigate or pyrite minerals in the shallow overburden. The magnetic mineral greigate only exists in a live seepage system and hence is a powerful charge indicator, whereas pyrite may relate to either a live or relic seepage system and can therefore result in a false positive hydrocarbon prediction. Microbial analysis, biochemical and geobotanical analysis are cost-effective technologies to indirectly detect the presence of seeping hydrocarbons by surface sampling and with satellite Synthetic Aperture Radar (SAR), in order to provide qualified charge input. The remaining technologies in Group C have not been widely applied in the industry; there are only limited case studies, and no documented track record is available. In summary detailed quantifiable structure and reservoir information are only provided by reflection seismic DHIs and partly by CSEM, while some other technologies can provide additional information about structure. CSEM is the technology providing the most significant input relating to retention. The parameter that is best determined is charge but with variable data validity. Charge information is very valuable, as the majority of wells are dry, but the prediction of charge may also be a result of breached trap integrity, increasing the retention risk (Schumacher, 2010). Table 1 provides an overview of the technologies where statistical probabilities derived from a historical track record are available and can provide input to the GCOS calculation. All the technologies have high average statistical probabilities, with some range of outcomes for each technology (Maver, 2019). These statistical probabilities can only be used as support in assigning fractions in the GCOS calculation, as past performance is not directly related to future predictions and the statistical probabilities are not necessarily geologically representative (Peel and Brooks, 2016). In general, it is the successfully datasets and case studies that are published (Abrams, 1996). Finally the data population size for some of the technologies is not statistically significant. By integrating data from technologies and doing technical work, value and certainty will not be added to the prospect portfolio by improving GCOS. New information will add value to the exploration cycle, but not by an expectation of improving the prospect risk. New information may result in an increase or a decrease of GCOS, but the expected result (the average of all possible outcomes) is zero change. Furthermore as GCOS is typically below 0.5 it is likely that new information will actually downgrade more prospects than are upgraded (Peel and Brooks, 2015). The main added value is from identifying prospects not to drill, thereby saving the cost of likely dry holes, and by choosing which wells to drill first, optimising the revenue stream from a successful well campaign. When including new data in the GCOS calculation, therefore, it is important to understand whether the new data is complementary to, independent of and does not replace the original information, or whether the new information updates and replaces an older piece of information (Peel and Brooks, 2015). Furthermore, to update with new information a simple Bayesian risking formulation can be utilised to help understand its impact on the GCOS calculation. A range of technologies are available to provide input data to the four parameters in the GCOS , but the decision about which technologies to utilise will depend on a combination of cost-benefit analysis, to what extent there is microseepage from the reservoir, and the specific information required to calculate a more reliable GCOS. AAPG Wiki, 2018: Risk: Expected value and chance of success. D. Schumacher and M. A. Abrams, eds., Hydrocarbon migration and its near-surface expression: AAPG Memoir 66, p. 1–14. Kunjan, B., 2016: Exploration Chance of Success Predictions – Statistical Concepts and Realities. ASEG-PESA- AIG 2016 August 21–24, Adelaide, Australia. Abstract. Kunjan, B., 2018: Retaining experience in Oil and Gas. GeoExpro, Vol. 15, No. 3, p. 28-33. Maver, K. G. 2019: Review of statistical probabilities from technologies used for pre-drill hydrocarbon prediction. Abstract submitted to EAGE, London. Peel, F. J. and Brooks J. R. V., 2015: What to expect when you are prospecting: How new information changes our estimate of the chance of success of a prospect. AAPG Bulletin, v. 99, no. 12 (December), p. 2159–2171. Peel F. J. and Brooks J. R. V., 2016: A practical guide to the use of success versus failure statistics in the estimation of prospect risk. AAPG Bulletin, v. 100, no. 2 (February), p. 137–150. Schumacher, D. 2012: Hydrocarbon Microseepage-A Significant but Underutilized Geologic Principle with Broad Applications for Oil/Gas Exploration and Production. Adapted from poster presentation at AAPG Annual Convention and Exhibition, Long Beach, California, April 22-25. Schumacher, D., 2010: Integrating hydrocarbon microseepage data with seismic data doubles exploration success. Proceedings, Indonesian Petroleum Association, Thirty-Fourth Annual Conference and Exhibition, May, PA10-G-104. Wagner, M., Wagner, M., Piske, J., and Smit, R., 2002: Case histories of microbialprospection for oil and gas, onshore and offshore in northwest Europe, in Surface exploration case histories: Applications of geochemistry, magnetics, and remote sensing, D. Schumacher and L. A. LeSchack, eds., AAPG Studies in Geology No.48 and SEG Geophysical References Series No. 11, p. 453–479. NEOS GeoSolutions integrates a wide range of geophysical and geological information to produce new 3D models of the earth’s surface, with the aim of helping exploration companies make faster, more informed decisions with less risk. There is an old adage that runs "The best place to find oil is in an oil field!"